I'm writing a series on alternative engagement photo ideas. Engagement sessions are something that many brides-to-be and grooms-to-be often struggle with. It's a love-hate relationships to some. They love to have some photos done but they feel awkward by the whole idea. Click to see a more recent Winter Engagement at the Bluffs and here to see a Engagement Session in the Snow. Winter is the quietest time in Toronto for good reasons. The weather is unpredictable and when it's cold it can get really cold. My fingers often freeze when I shoot a winter engagement. But for the same reason, this can be the best timing for couples who want to avoid the crowd when their engagement pictures are being taken. Also for brides and grooms who plan their weddings not far ahead, the timing for an e-session can be limited and a winter session might be just inevitable. For those who want to stay warm, an indoor session is ideal. 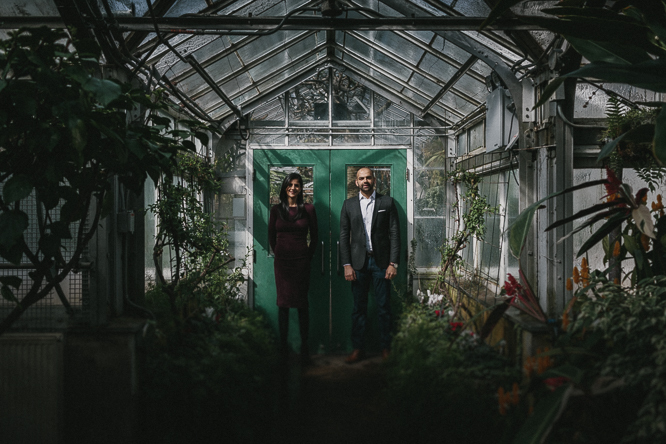 When it comes to indoor engagement session, location scouting is the key. I generally prefer spacial interiors, abundance of natural lighting and interesting elements to play with for creative portraits and documentary style images. Another benefit of a well-planned indoor winter engagement photo session is that we can always head out for a little bit of winter vibe. That way, we can have our beautiful Toronto winter captured but can still dress lightly in the cold weather and not freeze ourselves to death. Another obvious and more adventurous option for winter engagements is to pick a outdoor location and commit to bearing with the cold. It can be well worth it especially if we time the snow correctly. Outdoor winter portraits are gorgeous. Faces are elegantly lit by the light reflected from the snow. Snow engagements are also unique as not that many cities are blesses with the charming snow weather like Toronto. Finding a location that can showcase the snow is the key when it comes to a snow session. Brides-to-be can also wear their beloved winter coats and boots for the shoot. I suggest preparing a plan b when it comes to winter engagement shoots so no one get disappointed by the weather.